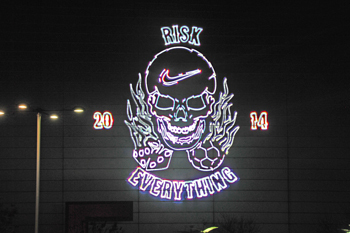 Lightwave International utilized two full-color direct-diode laser arrays to project for Nike, celebrating the launch of its 2014 World Cup Campaign – Risk Everything. The first chapter of the campaign aligns with the USA vs Mexico match with the image on the stadium to add impact to TV spot in the game on ESPN. The campaign’s film features Cristiano Ronaldo, Neymar and Wayne Rooney, highlighting the pressure felt by some of the world’s greatest players as they prepare to play on the world’s biggest stage – and their mindset to risk everything when it matters the most. Lightwave creates massive laser projections for Nike’s Risk Everything Campaign. The large format laser graphics are visible from great distances, and competing with the sun for brightness! Remove the stadium and laser beams would extend visibly for hundreds of miles! Risk Everything is another milestone in a series of large scale Nike projects following Nike Fuel at SXSW and Nike’s massive Camel Mountain projections. The technology used is similar to that seen in Lightwave International’s share of the Global Rainbow projects.